Cards' inside greetings read: It' s Christmas. Have A Ball! 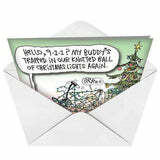 Set of 12 Humorous Christmas Card with 12 matching envelopes. Fits in a 5" x 7" envelope. Some styles are available blank or with a greeting inside. Many of our cards are sold in a variety of sizes and pack quantities including standard 5" x 7" singles, extra-large 8.5" x 11". Jumbo letterhead-sized cards, assorted-card boxed sets with mailing envelopes, and even note card stationery sets. You will also find 10-, 12- and 36-count boxed card assortments. 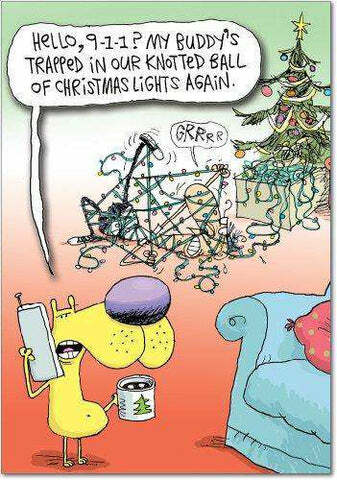 Perfect Humor stationery for writing Christmas wishes and ships with envelopes in a reusable box for your convenience. With the varied, wide selection of designs, styles, art and jokes on our cards, we have something for everyone including men, women, mom, dad, friend, boyfriend, girlfriend, husband, wife, bachelor, bachelorette, kids and coworkers. We even have something for your brother, sister, grandma, grandpa and mother-in-law if you want to give them a special, personal message. 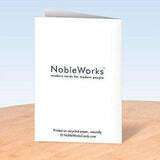 Founded in 1980, NobleWorks "and The Best Card Company, its non-humor division" is an award-winning brand and a New Jersey based, family-owned publisher. A proud board member of the Greeting Card Association, we strive for 100% perfection and customer satisfaction every card, every order, every time. 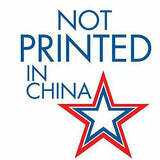 We are here to serve whether you purchased our stationery directly from us or from authorized resellers.